Lately I’ve been feeling as though there simply isn’t enough time in the day. Why can’t a day be twice as long? Okay, yes I get the science behind “time” and that I can’t just change the fundamental structure of the universe. But I’ve been finding myself in a predicament that its just not humanly possible to be in three places at one time, or answering more than 2 calls and an email all at the same exact same moment. We’ve all heard the saying, “time is money… invest it wisely”. I’ve always kept it there in the back of my mind. And sure, I’ve gotten really busy at work or a major deadline is looming – and there that saying was in the back of my mind to keep me focused & on-point. But never like it is today, or this week, or next week for that matter. Lately it’s been like my life is set at overdrive and I have to keep the race car on the track and prevent it from crashing. Yet, I’m completely challenged by the fact that there aren’t enough hours in the day to do all the things required to keep the race car on the track. You know what I mean… make the impossible somehow possible. Most of us have been there at least once. For those that can’t relate to the race car analogy. It’s like I’ve been hit with Tsunami wave of stuff requiring my attention – and everyone wants answers & solutions now or 10 minutes ago. Emails flow in at a rate of 1 per minute. I’m on a conference call and by the time its over I have 3 voice mails from people that need to be called back, and 20 more emails that need to be answered. And I’m already 10 minutes late to the next meeting. The weekend comes… and well my mind is never “quiet” from work. I need the weekend to think through challenges and come-up with solutions that I can make happen during the week. Then there are those sacred vacations. Yes, sacred vacations – when my mind finally goes quiet and starts to dream & live in the beauty of the moment. I know that I am not the first person to find themselves in this place. If we can’t figure out how to get more than 24 hours out of a day then how can we do all that we need to do and do it well? At times, the information flows at a speed that I can’t even filter out whats important and what needs my most immediate attention. Its not always this “bad”… there are those rare days, once every couple of months, that I can actually spend a whole day working on a paper or a project. I treasure those days. Its like a day of peace. I love it. On these days I can go for a run in the morning and not feel guilty about it. In the midst of this major dilemma I am having over time – and my lack of ability to get more than 24 hours out of a day. I’m finding a lot of my “time” is spent dealing with politics – navigating power & money hungry DC players. I make my very best attempt to influence things in the background so that the right thing happens for the right reason with not direct benefit to myself personally. Its a twisted battle of good versus evil, but in this little microcosm that defines my professional life. Do I really have time for these battles? No, but I try to pick and choose them wisely. I’m not always wise though in these decision, I still have a lot to learn. As I reflect on this conundrum on time, I think about the broader context of how finite time really is. 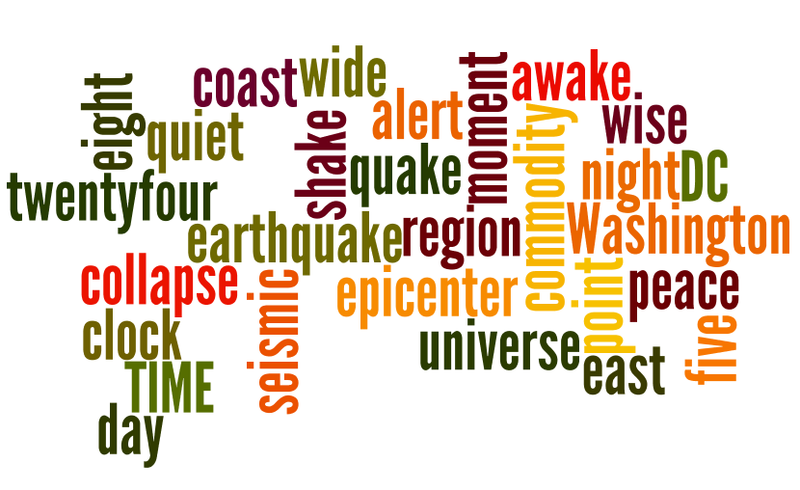 On Tuesday I felt the grumbling begin and then my office began to shake – it was an earthquake alright. As I biked home that evening, I stopped at a red light in front of the World Bank building and the sound of their alerting system gave me goosebumps… the sound reverberated through the streets of downtown Washington DC, “There has been a region-wide earthquake, everyone must evacuate the building.” The World Bank building did not collapse, but this moment meant so much more. It reminded us (and me) about the fundamental limitations of time. All this time we invest day-in and day-out in creating & building this “infrastructure”, or however you characterize the fruits of your labour, could somehow become completely meaningless history in a matter of seconds. I’ve come to the conclusion that time truly is the most precious commodity. And unlike other commodities, time is the one commodity that you can’t get more of. I need more days of “peace”, where the information flow & task lists are manageable. Where my professional life is balanced with my personal needs. Guess that is my goal for the next 5 years of my life. 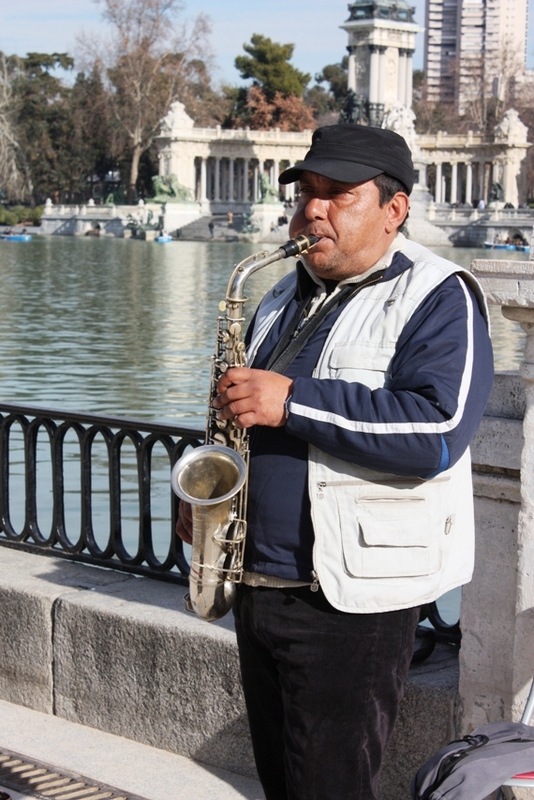 I wonder what advice this musician from Madrid would share about time? My time traveling through Asia has come to end. So much to absorb, its almost sensory overload… I’ve only shared just a few ounces with you through this blog but I am sure I will “travel to Asia” again through my writing. I have just one word to sum up the experience – Gratitude. I could go on to list the multitude of moments during this trip that have taken my breath away, that I am forever grateful for. However, here are 5 Buddhist words of wisdom that I learned in more ways than one during this adventure through Southeast Asia. I hope you’ve enjoyed the journey! Personal Growth – He who experiences the unity of life sees his own Self in all beings, and all beings in his own Self, and looks on everything with an impartial eye. Family & Love – A family is a place where minds come in contact with one another. If these minds love one another the home will be as beautiful as a flower garden. But if these minds get out of harmony with one another it is like a storm that plays havoc with the garden. Paradigm – Better than a thousand hollow words, is one word that brings peace. Life Philosophy – I never see what has been done; I only see what remains to be done…There is nothing so disobedient as an undisciplined mind, and there is nothing so obedient as a disciplined mind. Professional Growth – An idea that is developed and put into action is more important than an idea that exists only as an idea. In less than 5 minutes I crossed the transient waterway of the Mekong River and entered into an entirely new land, and delved into an entirely different culture and way of life. Welcome to Thailand and the heart of the Golden Triangle! As soon as I stepped out of the wooden canoe and onto land, I could feel the difference. You could feel progress & motivation in the air. In just a couple of minutes we found an air conditioned truck serving as a taxi to take us to Chiang Rai – and to top it off the taxi driver (and owner) was a woman. I could hardly believe it a female taxi driver, who speaks English, in a comfortable air conditioned truck – wow! This is Thailand alright. We are still at the Thai-Lao border and we try to buy some provisions using our left over Lao Kipp (the Lao currency) and they don’t accept it. 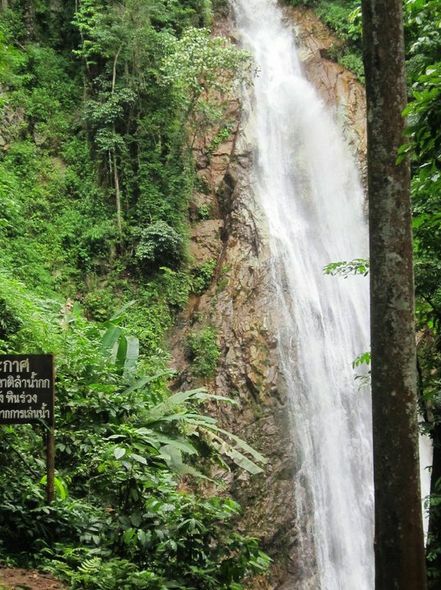 We tried for days to use our Kipp all over Northern Thailand, and no one would take it. That is communisim for you! it was the same way with the Cuban Peso. The scenery on our two hour drive from the Lao-Thai border to Chiang Rai was spectacular – an expansive fertile river valley dotted with humble homes and farms. I noticed that here the average rice farmer uses some mechanical agricultural equipment whereas in rural Laos everything was done by hand. We passed by a few dozen children dressed in their school uniforms, their hair neatly cared for, bright white socks & polished shoes, all riding their bikes home from school. Northern Thailand is lovely. This kind of ultimate relaxation lasted a couple of days. Enjoying the garden oasis swimming pool. Meandering through the streets of Chiang Rai. And like the icing on a cake – a full day at the spa – aromatherapy cleansing sauna, ayurvedic massage, and some reflexology. There is no better way to rejuvenate at the tail end of a long & arduous adventure through Laos. This is exactly what my body needed. It brought my body and soul back into alignment, balancing my chakras. After a couple of nights of good sleep and days filled with warm sunshine & refreshing dunks in the pool we were ready for another challenge. 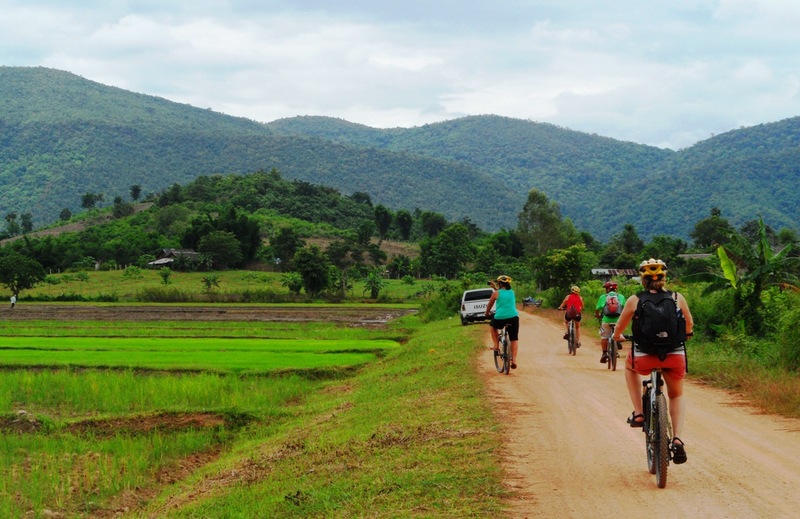 This time mountain biking throughout the greater Chiang Rai area – 50 kilometer bike trip with the best tour service I’ve ever used Chiangrai Cycling Tours. And I do mean it was the best tour – and day overall – in my life. Everything about it was amazing. Bee (one of the tour company owners) picked us up from our hotel and we headed out a couple of kilometer to where the got fitted with mountain bikes and helmets. Off we went… biking through small neighborhoods then onto dirt road through the Northern Thailand country side. Complete serenity. We stopped every several kilometers to check out some of the wonderous little intricacies along the way. Our guides, Bee and his brothers, gave us the “inside scoop” on life in the Golden Triangle. We stopped at a neighborhood crematorium – every neighborhood (even in rural areas) has their own crematorium, which is a central part of their Buddhist ways ( referred to in Thai as Lankavamsa. We continued on stopping at a nearby temple. There were many temples, one in each of the little towns we passed through, much like you have a church. Except “going” to temple is different than “going” to church. The temple is a sacred place and people come to visit when they choose to come to visit, no particular time. There aren’t daily mass services like in Christianity. Like all spiritual “houses”, these temples are equally ornate and cherished by the people. 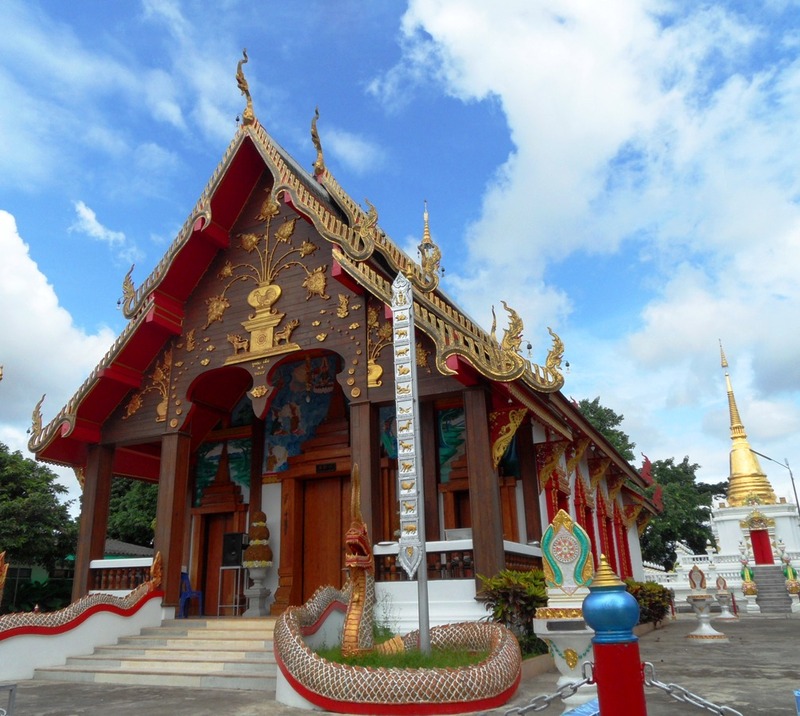 Many of the temples also have pagodas surrounding them that serve as Wats for all the monks. It is very typical for young men to spend anywhere from 1 to 20 years studying monkhood in a Wat. Our guide and his brothers were all Monks for several years. I appreciate all the special little factoids they bestowed on me about Therevada Buddhism and their cultural practices. As we biked through rural areas, forests, and farms we’d also stop along the way to check out neat little “treasures” in the Golden Triangle. At one stop Bee stopped to show us the birds nests that hang from the trees like woven sacks. Its so facinating how something so unique also exists in Costa Rica, some 17,000 kilometers away. 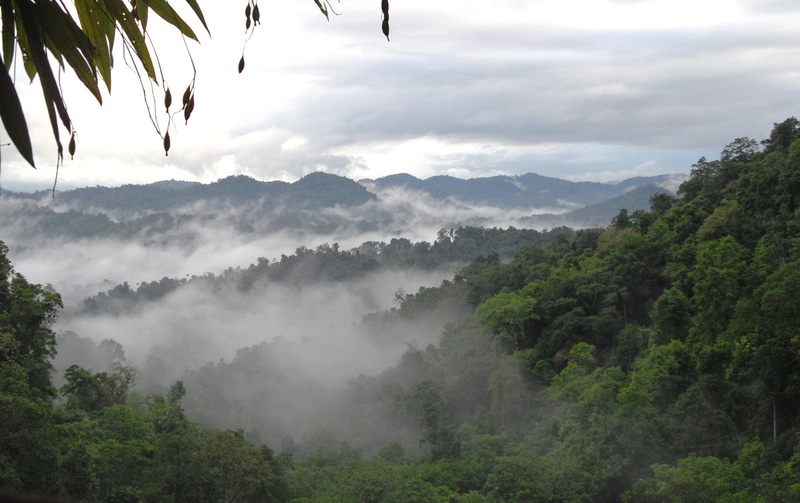 Nature impresses me at every turn – here in the “utopia” of Northern Thailand and in the humble tranquility of Laos. 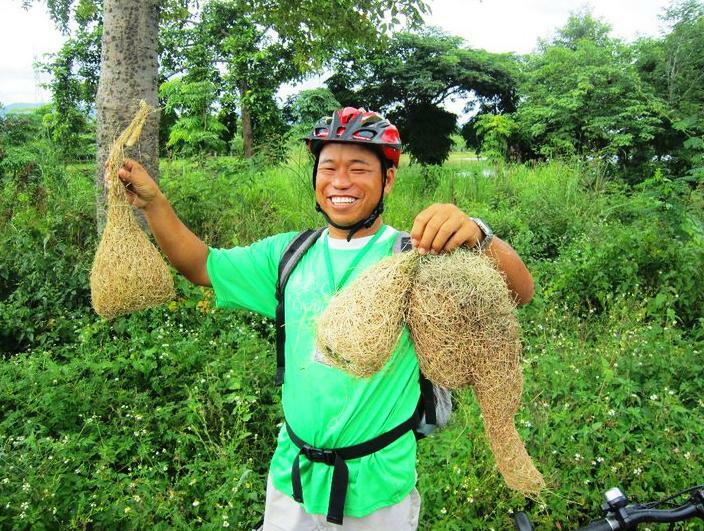 I know what some of you are probably thinking… our guide “stole” the nests from the birds, how horrible! Well actually the birds abandon the nests after a season and the old nests eventually fall to the ground. Bee was showing us the structure of fallen birds nests. So no sad birds without homes on our trip! This is just one of those little things about this bike trip that made is just awesome. 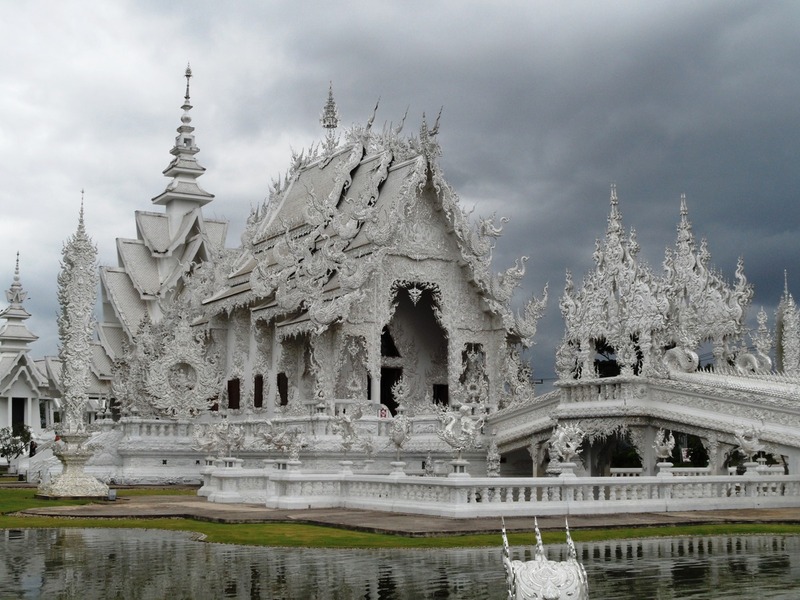 We biked onwards, another 15 kilometers or so, until we reached the revered White Temple – known as Wat Rong Khun. 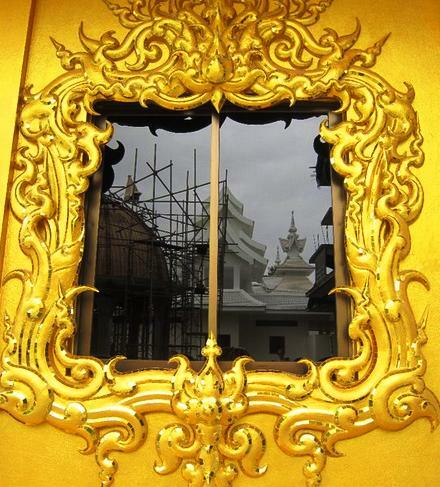 It is modernly majestic & totally unconventional – its a Buddhist AND Hindu temple – how cool! 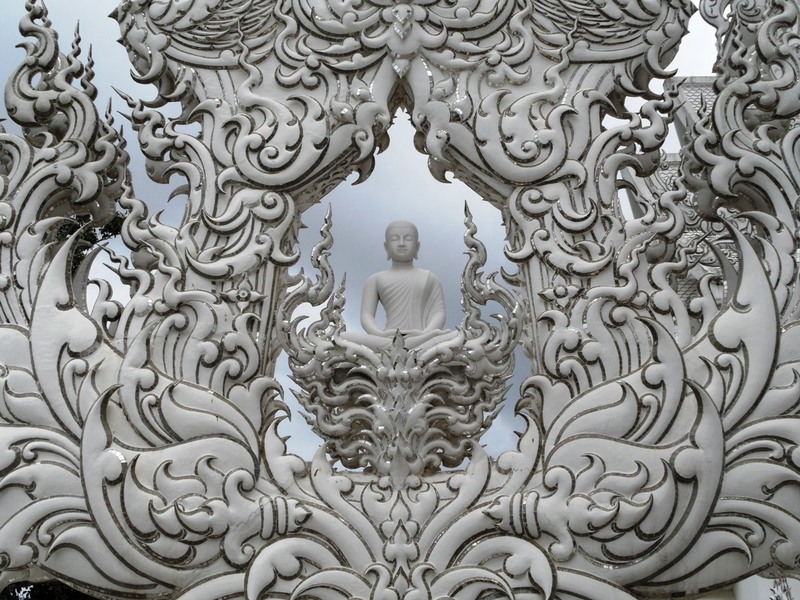 It is all white, representing the Lord Buddha’s purity and the use of glass in it’s design represents Buddha’s wisdom. It is a piece of modern spiritual history and is still a work in progress today, much like La Sagrada Familia in Barcelona. Its design is both dark and enlightening, each reflecting a facet of life on Earth. Ornate sculpture of all sorts of dreams and mysteries surrounds the temple. We spent several hours walking through the White Temple. Its interior is floor to ceiling mural artwork all over the walls with some of the most intricate and socially & politically profound messages. The interior painting glows, and brigs forth issues of nuclear security, resource wars, and ideological wars between Islam and the Western world. It also ties-in the spiritual aspects of Buddhism. There are paintings of fish (water), elephants (earth), swans (wind), lions (fire), and simply nature. 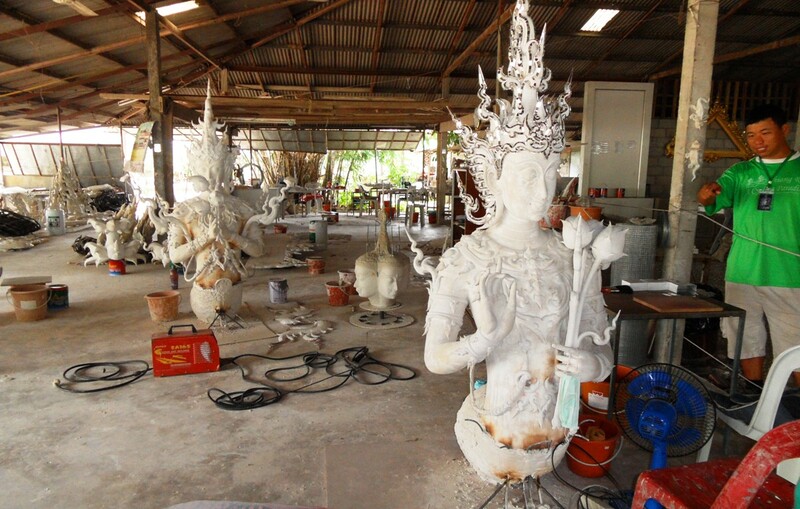 We continued through the temple and even had a chance to walk through the “workshop” where the artist and his teams continue to build sculptures for the continued development of the temple. It is an incredible feat for humanity. 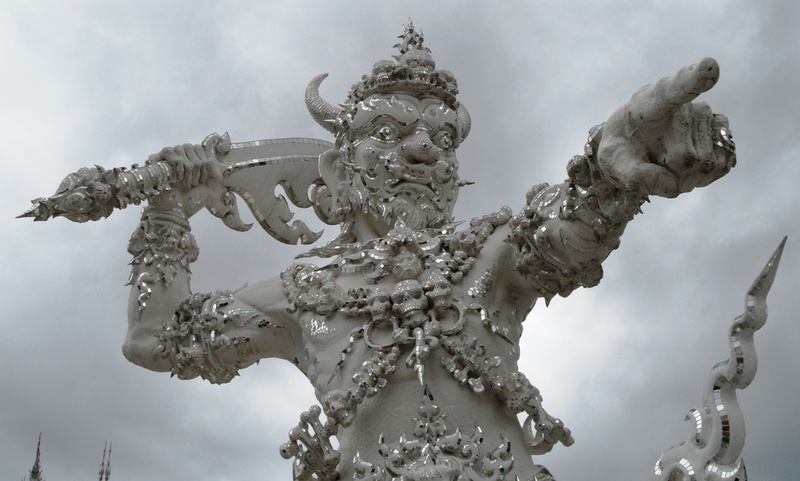 Then, the best part of all, we were walking through the village surrounding the temple and we go to stop by a small museum, and standing right there is the artist responsible for this living masterpiece – Chalermchai Kositpipat. Our guide, Bee, introduced us and we were able to talk with him for a few moments. He is a very spiritual person, also formerly a monk, and was born & raised in Chiang Rai. He is a renowned artist in Southeast Asia and much of the world for his painting and sculpture. Much of his work is “not for sale”… even several million dollars can not buy you one of his paintings for he prefers them to stay in Chiang Rai where visitors from around the world can come and enjoy them in the museum. I feel so blessed for having had the opportunity to be here, to see, feel and live this remarkable treasure in rural Northern Thailand. 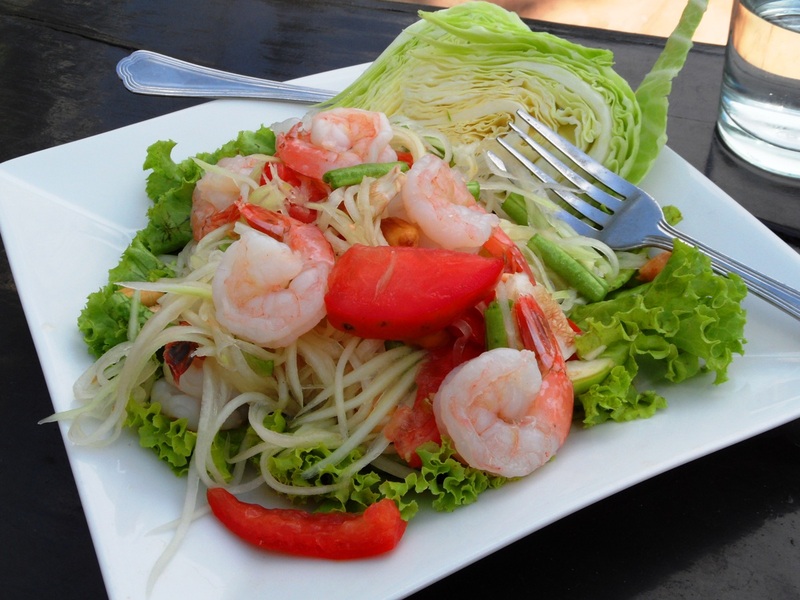 Our bicycle trip didn’t stop here… we stopped to enjoy a traditional Northern Thai lunch. I enjoyed a bowl of delicious chicken soup cooked in coconut milk broth with lemon grass, veggies, hot peppers, and rice noodles. It really was divine, and it cost just $1 – that is not a typo! Life is Good here in more ways than one! Another 15 or so kilometers to go, most of which were uphill into the mountains outside of Chiang Rai – we were headed for Doi Luang National Park. Just a few kilometers into the final uphill stretch and the heavens decided to open up, like they never had before. It was pouring cats and dogs – like a brief monsoon rain. The roads will filled with water. That didn’t stop us. We kept peddling away. 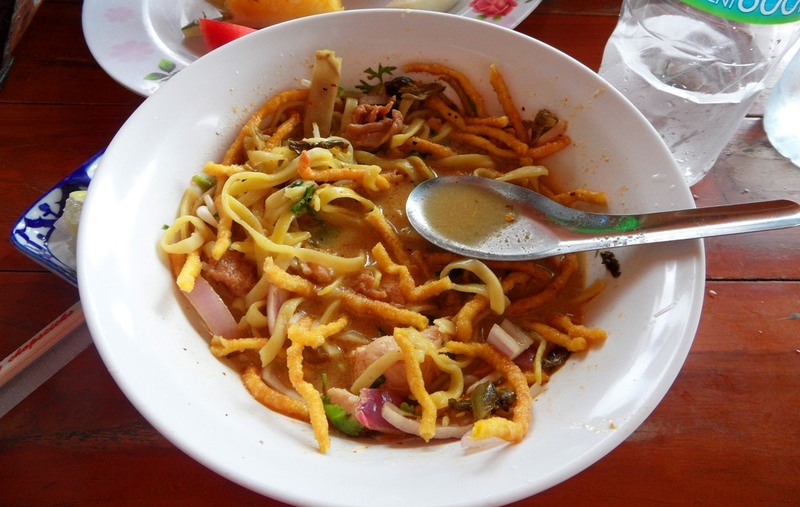 Its almost like the thai special soup and the white temple had also given us an extra dose of energy. A feeling of rejuvenation came over me as I peddled up into the mountains with the rain pouring down. I couldn’t stop smiling. About an hour later, and totally sopping wet, we entered the boundary of the park… just 5 more kilometers to climb. It was enduring. I was tired but determined and strangely energized at the same time. Then we reached the place where we stop and hike into the park. Yes… after biking nearly 50 kilometers, we are now heading out for a 1.5 hour long hike into the mountain. The cherry on top of the day, was a visit to one of the grandest waterfalls in the world. It was beautiful and so worth the hike. Oh… and there were NO leeches. This did make is it so much more enjoyable. Hiking back out from the waterfall, I realized how deprived of energy I was feeling. And then we arrived at our Guide’s truck and there was a spread of delicious Thai snacks for us… tempura sweet potatos, banana bread, and my new favorite thing – mangosteen! After enjoying these delicious Thai treats it was time to hop on the truck and head back to Chiang Rai. All I can say, is WOW! This was one of the best days of my life. I feel so blessed. I can’t believe its been over a month since I came back from my “once in a lifetime” rendezvous in Southeast Asia, and I regret to report that I’ve been in overdrive running a million miles. Needless to say that is my life in the “202”, that 68 square mile diamond-shaped swath of land, where my life revolves around all the seemingly irrelevant facts of life – politics, money, power, and a dose of healthy intellectual stimulation every now and then. Basically when I landed at Dulles Airport, I bounced right back into the groove of this rat race almost like I had never left, except for the 200 or so people that were waiting for responses to emails or returned calls. Yikes! No time for reflection. Letting your mind travel back in time is such a fun escape from the madness. So amidst the organized chaos of my daily life I chose today to get back where I left off… Northern Laos. I woke up this morning to, what I thought, was some major parade and festival filling the streets with music and people celebrating. All I can hear is a myriad of different instruments and people singing and talking from my second floor hostel room. Its about 6:00am and the sun has just risen, I scurried about the room to get myself together and ran out the door and down the hall to the front balcony of the hostel. There is no parade or festival in the slightest way. Instead a group of 3 Lao men are simply celebrating life. 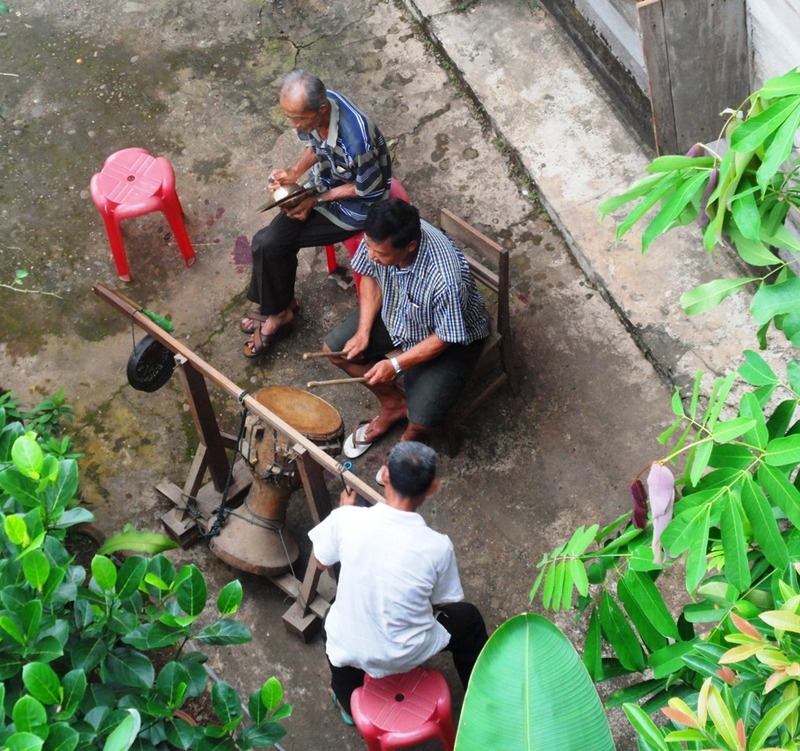 there they are in the front yard area of the little house next to the hostel making music! They are just having a good ol’ time (seemingly sober too) singing, playing guitar, hitting the kong, and playing a few other instruments. And this I suppose is just daily life in Laos being revealed to me in yet another color. At this very moment, I realize that (much like the 20+ hour boat ride) I really had no idea what was ahead of me. Hence the title of this blog – All Shall be Revealed! After a short 5-10 minute video on “safety” at the headquarters of the Gibbon Experience (but don’t be misguided by the website, be sure to checkout these reviews on Trip Advisor, they are most accurate) I hopped in back of a pick-up truck with my backpack and we were off. We sped through curvy mountain roads along what appeared to be the only paved road around. We passed through beautiful rice patties and terraces, swaths of forest, and occassionally we came to a halting stop for some cows that were basking in the sun in the middle of the road. After about an hour we made a short pit stop at a little road-side hut selling basic provisions, then back in the truck and we were off down a dirt road driving through small rivers and all the rest. We had just picked-up a young man as well (whose name is Yia Lao) who we learn is our “guide” for the our jungle tree house adventure. I continued onwards, leeches and all, hiking up hills in dense bamboo forests. The hiking was beautiful, energizing, and challenging all at the same – I love the feeling of nature testing my limits. The forest was mostly “secondary” forest, meaning that it had once been clear-cut pasture land and natural succession brought forth new forest growth. 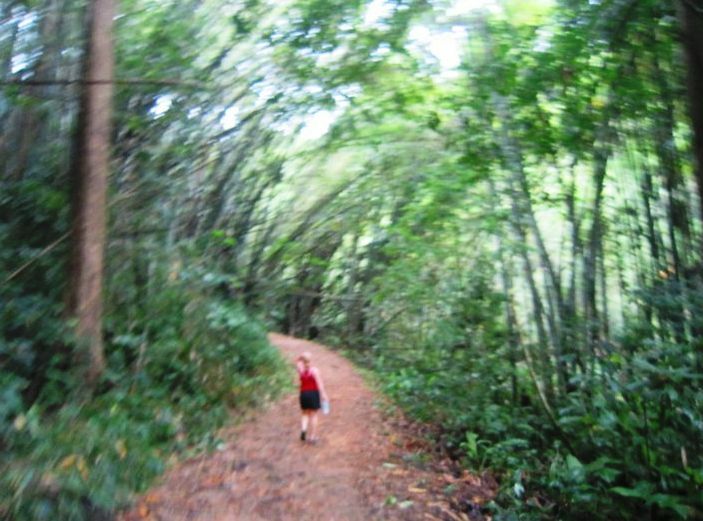 Most of the trees stood tall and swaths of bamboo bent and swayed with the winds. It was enchanting. After a few hours of hiking we arrived at the first platform. Yia Lao gave a 30 second refresher on the procedure for “clipping” onto the line & the minimum safety basics on checking your harness and caribeaner. That was the first & last time we even did so much as talk about safety. Its a case of, here you are and here you go. Live it or loose it. Here we gave our harnesses one last blessing and one at a time we clipped the carribeaner to the metal cable waiting for the person ahead of us to reach the next platform, said a prayer, lifted our legs into the air. And vavoom – there I was flying across a valley of dense foliage, some 800+ feet in the air, at a speed of somewhere between 20-30 miles/hour, for nearly an entire kilometer or more. I was careful to keep my legs poised upwards so to keep my body (weighed down with a heavy pack) perfectly postured and balanced with the cable. I did not want to even do so much as risk stopping (or spinning) mid way across the zipline. It was exhilerating… I looked around and all I could see were these vast tropical forested mountains. Below me I could see a small river valley and a herd of water buffalo. 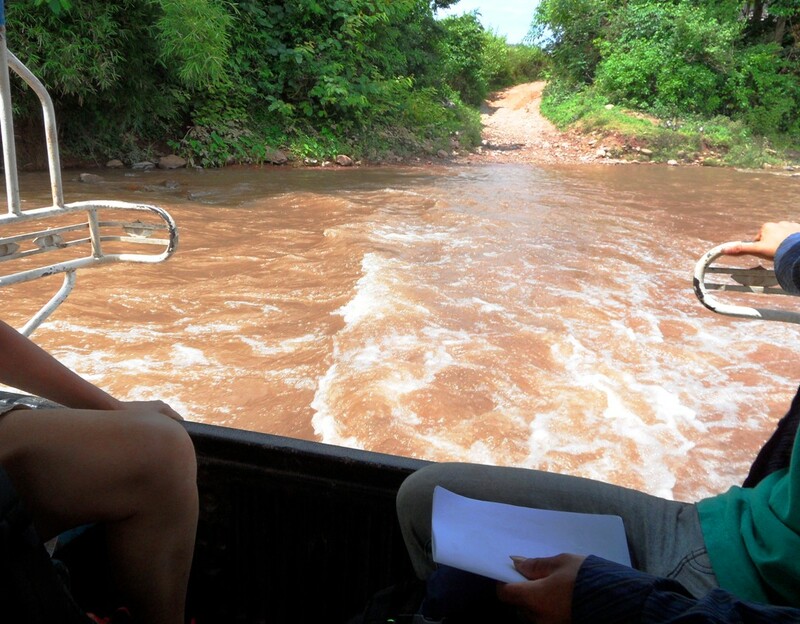 Here I am in Northern Laos, flying through the landscape. A reality beyond my wildest dreams. A dozen or so zips later, each time counting my blessings, and we arrived at our tree house. 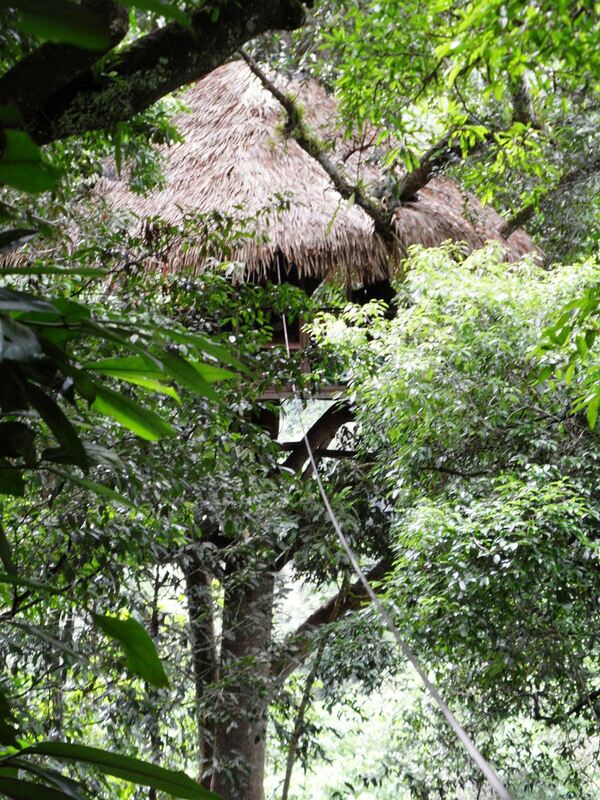 Yes, a real treehouse perched 600 feet on a beautiful tree in the Bokeo Nature Reserve. Its the kind of tree house I dreamt about as a child. Its incredibly rustic and beautiful. I am in complete awe at my surroundings. So far from anything remotely considered civilization. No cell phone signal, no signs of even a near-by village. Just this group of adventurous spirits, Yia Lao, and the flora & fauna of Bokeo. If you’re having a hard time visualizing it, think of the landscape of Pandora in the movie Avatar. Yup, that is Bokeo, and that is what you come to the Gibbon Experience to feel and be one with. 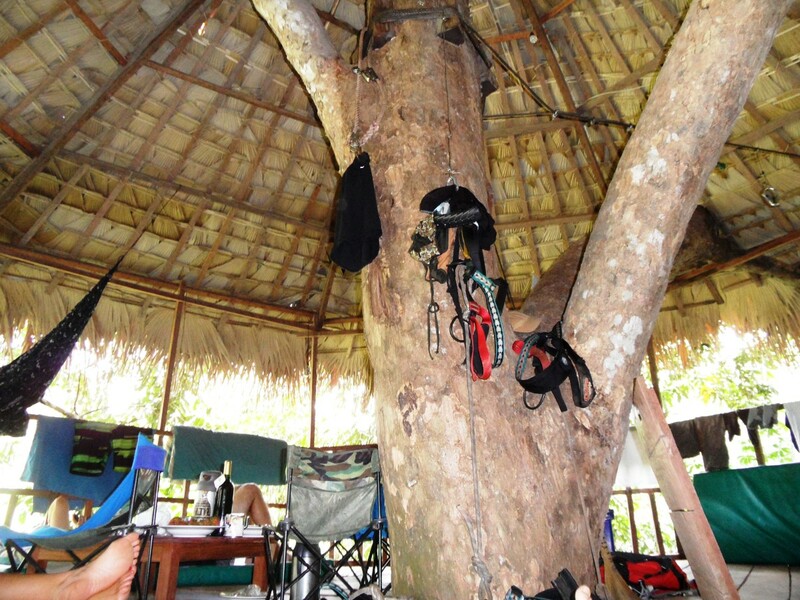 We laid thin sleeping pads out onto the wooden planked floor of the tree house, chilled out and ate some fresh mango. This is not what you would envision as a “luxury” tree house by any stretch of the imagination. All that separates you from the tree house and falling out is a mediocre wooden guardrail. There is no safety net to catch you if you are careless or a ladder to come down if the metal zip cable breaks from a tree that feel in the night after it was struck by lightening (just think about that for a couple of minutes and you will get what I am insinuating). I eat a piece of juicy mango and pop a lyche fruit into my mouth, Life is Good for now. Then I decided to explore the bathroom. I push back the little curtain and viola – Asian squat toilet, why of course! Only this time its 600 feet up in the air. The best thing of all was taking a shower. Here I was, totally isolated, high in a tree house, surrounded by nature. I reached over the wooden rail to turn the water lever on and glorious rainwater poured over my body. I starred out into the lush hills. I looked down and saw the rainwater sprinkling down into the tree and there were also water buffalo grazing in the valley. This was the best, most cleansing, outdoor shower of my life! A couple of hours later it was dinner time. Yia Lao graciously zipped into the tree house with a bag carrying our food. 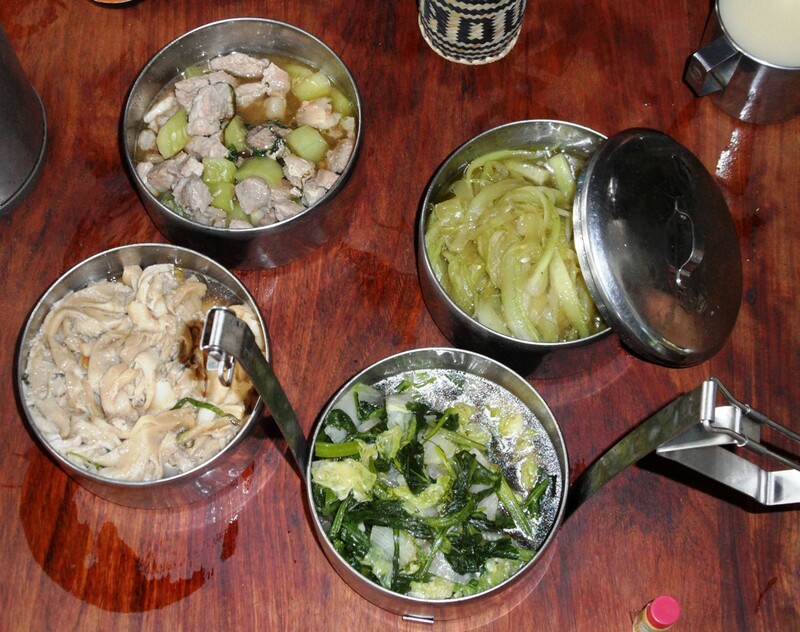 A bamboo rice carrier was filled with sticky rice and a stack of 4 metal tins contained our food. Each tin had a different dish. Forest gathered mushrooms stewed in broth & spice, sauteed greens from a local garden, and morsels of succulent pork with chile. It was divine. As the sun began to go down the clouds rolled in and skies opened-up. Rain poured down all around us. Lightening and thunder also roared in. There were some leaks in the thatched tree house roof but it didn’t matter. The sound of the rain pattering on all of the trees and leaves took over the ambience. It was so peaceful and cleansing. There we were in the clouds as they fed the forest with life energy. We sat around on the wooden tree house floor and played a few games of cards, talked, and drank a cup of funky Lao wine. We then pulled out these large pieces of black fabric and draped them over our sleeping pads, like the kind of tents or shelters you make with blankets & boxes as kids. We each slept below these draped fabrics to keep the mosquitos, spiders, and tree rats out. I slept just a few inches from the edge of the tree house, next to the railing. No rolling over too far, or well, you may just roll out of the tree house. It was just fine. And I slept wondefully listening to the music of the birds and the bees. I awoke at sunrise, pulled the fabric up, and looked over the railing. There before my eyes was an incredible sunrise. Clouds hung in the trees & valleys below and around me. In the distance the sun slowly revealed her life force to all that remained in Northern Laos. Complete serenity. It was magical. I don’t really know what to say next. The next several days were filled with much the same. “Same same but different” as they say in Asia. It was breathtaking, spiritual, challenging, fun, uncomfortable, really freaking scary all at the same time. Each moment revealed something new and unexpected. I “graciously” overcame my fear of heights and enjoyed it in the process. I developed a new appreciation for safety and the safety regulations of the “developed” world. I learned that I am no longer the fearless 20 year old I used to be. I am not invincible. I realized that cherish life more now than I used to. I spent time in nature a way I never had before. And well I gave a few ounces of my blood to the leeches of Bokeo Nature Reserve. Was it worth the long boat ride, tests of patience & sheer discomfort. Absolutely YES. But I am honest in sharing that as glorious as the Gibbon Experience was, I will never do it again. Why? Simply because I know that I am not invincible. And it was NOT safe at all. I take risks all the time. 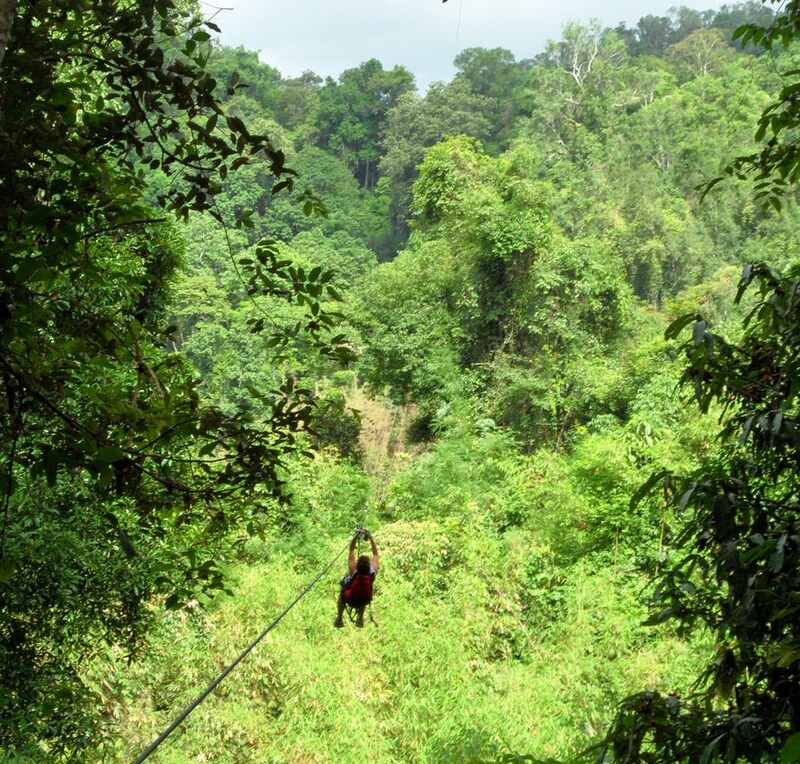 But relying on worn-out harnesses & equipment as your life line to fly through the forest – and a complete lack of basic safety & first aid by your “guide” – made it glaringly obvious that safety was hardly a consideration. So lack of safety revealed, Bokeo was incredible and I am forever changed by all it has taught me.